This month, it got to about the 20th and I realised that I didn’t really have any standout favourites for the month. 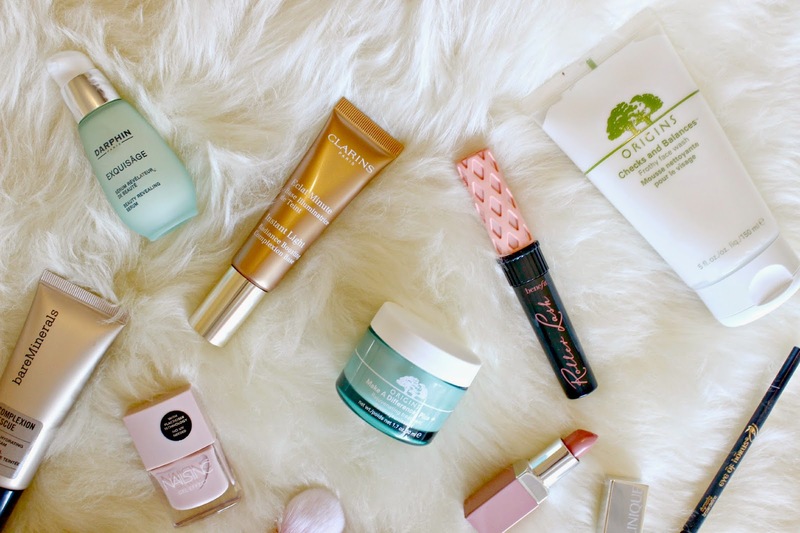 A favourites post would have been pretty darn boring if it was just repeats of last month (because there are so many products from my Feb Favourites that I’m still loving!) … but then came the Spring launches! 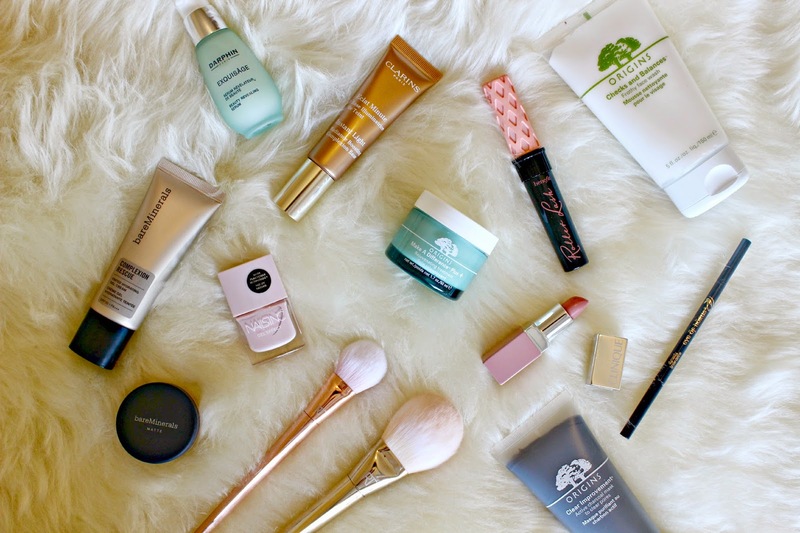 A few of my favourite brands launched or relaunched some products and suddenly I had the opposite problem – too many to choose from to condense down into my favourites! So not of these products have already swept in to Favourite Status after just over a week of me trialling them out, but when you know, you just know. Right?! Firstly, skincare. After doing quite a bit of travelling recently, I was on the hunt for something to bring a bit of brightness and vitality back into my complexion when I read about the Darphin Exquisage Beauty Revealing Serum. It sounded like exactly what I needed, and my skin has been drinking it in since I started applying it about 10 days ago. It’s officially made for anti aging as it’s famed for reducing wrinkles and stimulating the production of collagen, but even though those are not my skincare concerns, using the serum pepped up my complexion leaving it noticeable smoother and brighter. It absorbs in just a few moments so I don’t have to hand around before applying moisturiser, and my skin feels quenched so a thick cream isn’t needed afterwards. So after the serum I’ve been applying the Origins Make A Difference Plus + Rejuvenating Treatment. I thought it was a mask at first, but actually you apply it AM and PM (although I’ve been using the Night Cream version in the evenings) to keep skin looking and feeling moisturised and balanced. Its more of a gel formula and I find it is great at keeping my combination skin a little calmer and I haven’t been noticing an oily T-zone as the afternoon approaches when I use this combo. After a skin analysis session, I was told I needed to exfoliate more so I’ve been using my Clarisonic far more regularly. It needs a foamy face wash and the one I am currently using is the Origins Checks and Balances Frothy Face Wash. For my combination skin the formula is absolutely perfect, as it’s gentle but completely soaks up any oiliness. One of the key ingredients, Broadleaf Kelp breaks down dirt and excess oil so while your skin is deep cleansed, it also feels comfortable and not tight after using with the Clarisonic. Just to round of my Origins preach, I got my hands on another of my absolute favourite face masks, the Clear Improvements Charcoal Mask. It’s just brilliant – it’s so fun to apply because of the colour and texture, and you can almost feel the charcoal ingredients pulling the dirt from your pores. Isn’t that a lovely thought?! Onto makeup! For the base, a new Spring launch has been an absolute game changer for me. The Clarins Instant Light Radiance Boosting Complexion Base changed the way I viewed radiance enhancing bases – for real. As a prone-to-oiliness type I used to stay as far away from shimmery products as possible, and I threw most radiance bases into this camp. I tried the Clarins Instant Light thinking that it would be the same, glittery/shiny face situation but no. Oooh no! It’s beautiful. With absolutely no flecks of shimmer but instead, a magic ingredient (I have no idea how they do this) that makes your skin just glow. That kind of glow which is usually reserved for when you’ve been on a beach for 10 days – Clarins have bottled it. Next, a tinted moisturiser. Or Tinted Hydrating Gel Cream to be more precise! With the skincare combination I mentioned above, my skin is being pretty darn good recently and a thicker foundation has been cast aside in favour of the Bare Minerals Complexion Rescue. Now this is a fab product because it has so many benefits combining skincare and radiant coverage in one easy to apply formula. It feels like a BB, but gives me just a little more coverage. My skin feels hydrated and generally happy when I wear it, and over time the product delivers skincare benefits to improve moisture levels and antioxidant protection. If I do need a top up during the day, but don’t want to cake up with powder I’ve recently discovered the Bare Minerals Powder Foundations (late to the party I know!) which is eliminates any shine but without adding an extra layer. For general makeup application, this month I have been really enjoying using my Real Techniques Bold Metals brushes. Firstly their beauty just amazes me every time I use them, but also they are so soft and I find they pick up the perfect amount of product. I feel like Nic and Sam knew exactly what I wanted when they created this range! A rather exciting package arrived from Clinique while I was in Texas, and inside was a selection of shades from their new Pop Lip Colour & Primer range. They combine the velvety feeling of a lipstick, with fab pigmentation levels, with the smoothness of a primer which ensures that the colour lasts for hours and hours. A few of the shades in particular caught me eye; and I’ve been wearing Beige Pop almost every day since! For my lashes, I’m absolutely loving the Benefit Roller Lash Mascara. I’ve even been leaving out the liner recently because the amount of volume and length I’ve been achieving from this mascara gives enough of an impact that I can skip it out. As with all Benefit products, it launched with gigantic buzz, so I couldn’t wait to see if it was worth the hype. Not only does it look cute, but it truly does lift, separate and build lashes plus the formula feels nourishing and doesn’t flake away. An all round winner! For my brows, sadly my Anastasia Brow Wiz ran out, but I have found an alternative/dupe which I actually prefer to the Anastasia! 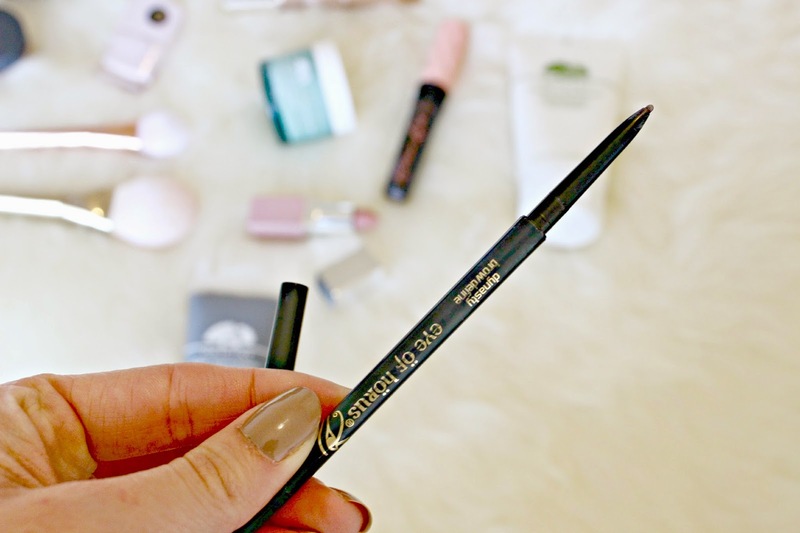 The Eye of Horus Brow Define is a double ended product which lets you comb and fill in brows, and the Medium shade is absolutely perfect for my blondey brown brows. As its one of those scrolly pencils, it never needs sharpening and you can always achieve fine hair-like shading which lasts all day long. Last but not least, the whole Nails Inc Gel Effect Range. The formula gives high gloss nails which almost look plumped, exactly like when you get a gel manicure, and the easy to apply polish has far better lasting power than any of my usual formulas. I’m currently loving their pastel pink shade, but they also have some richer shades which I’ll definitely be turning to when we get closer to Autumn. Wow, I seem to have written an essay here – what can I say, I’m very passionate about my March Favourites! 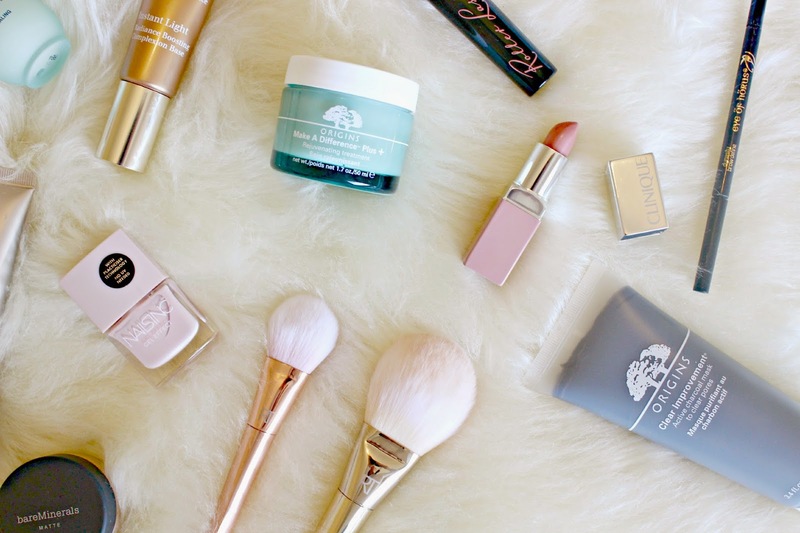 I’d love to know if you’ve tried any of these products, and let me know your March Favourites!